Last night I finished stitching a label on my Architecture Challenge quilt so that I can drop it off for my local guild quilt show and realized that I hadn't posted the finish here . . . 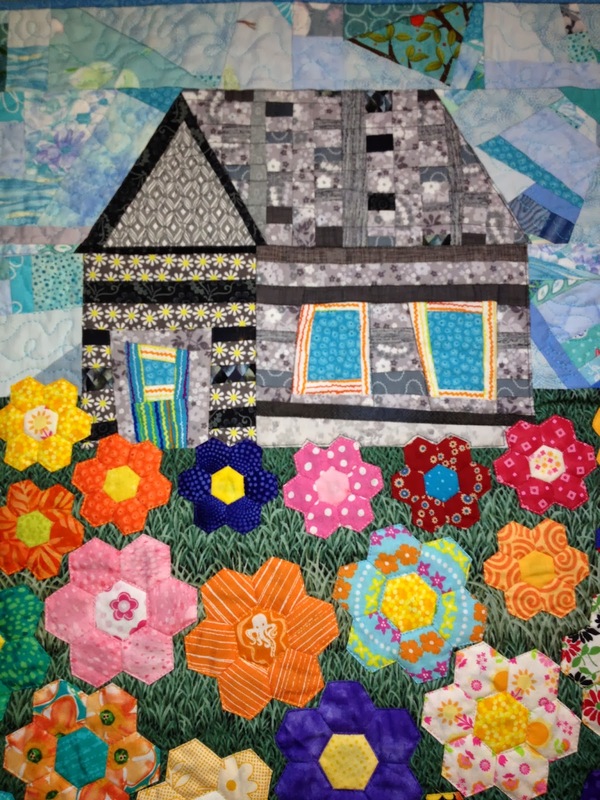 I have to thank Julie Sefton who blogs as Quiltdivajulie for her great Barn Quilt that was the inspiration for the free piecing of the cabin and the made fabric sky. 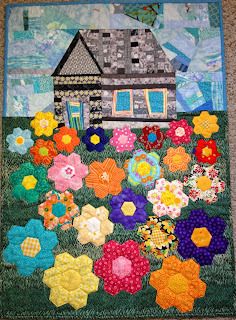 The hexies were hand pieced then basted to the quilt top and then I layered the quilt and stitched around the outside of the hexies and the centers of the larger ones to quilt as you go! The rest was a combination of walking foot and free motion quilting. This one is going in the Modern Quilt section of the show. Great finishes, Jane! Your "charming" cottage looks like those old log cabins you see while driving through the countryside, so lovely! And your color challenge, wow! Looks great! I love your cottage!! So much fun! I am inspired to see how simplicity works so well! 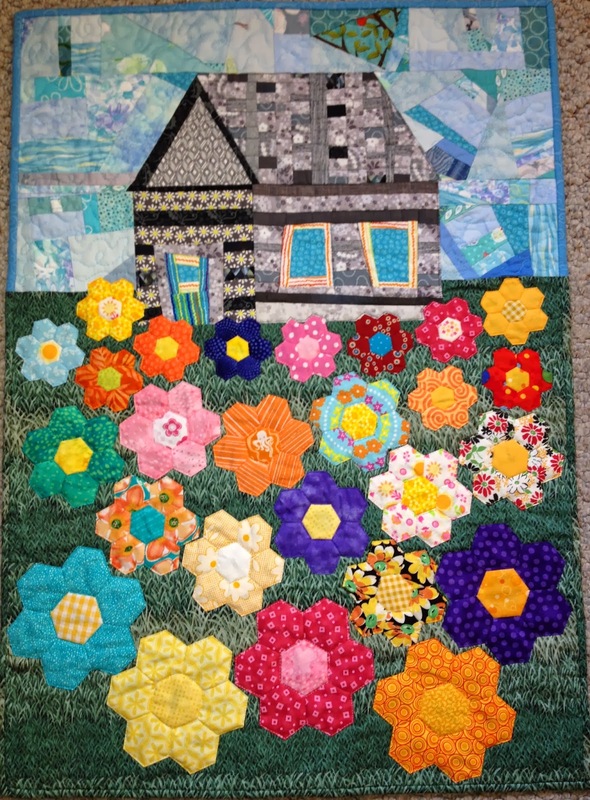 Your architectural/hexie flower garden is wonderful ... as is the color challenge! So glad you posted them!!! both are great! 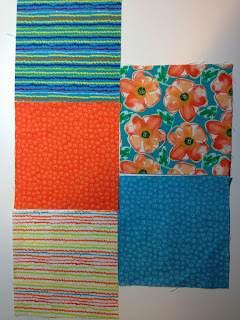 I remember following on the blog during the color challenge and seeing your individual blocks. What a nice layout and I luv your background color! 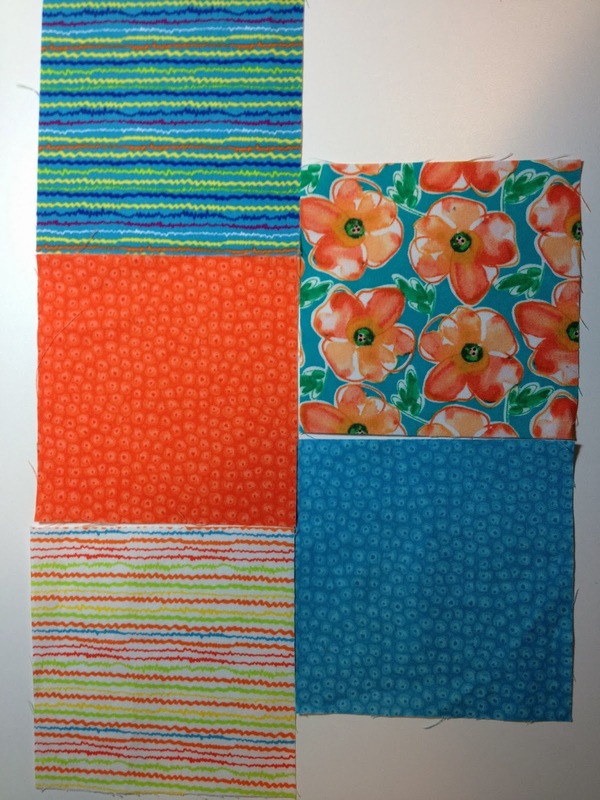 I just love both of them but your color challenge quilt is truly stunning! What is the background fabric? It looks a lot like the old cheddar that was used back in the late 1800's. Your Color Challenge is magnificent.....especially when backlit! i love your barn quilt, seriously wonderful, and the other one is reat too, you have been busy !